One of my favorite Sunday breakfast with my family is Aloo Paratha . Partha are whole wheat unleavened Indian bread . They are both plain and stuffed. You can use different kind of stuffings like cauliflower(gobi), radish ( Muli), cottage cheese ( Paneer), potatoes ( Aloo ) etc, when making stuffed parathas. 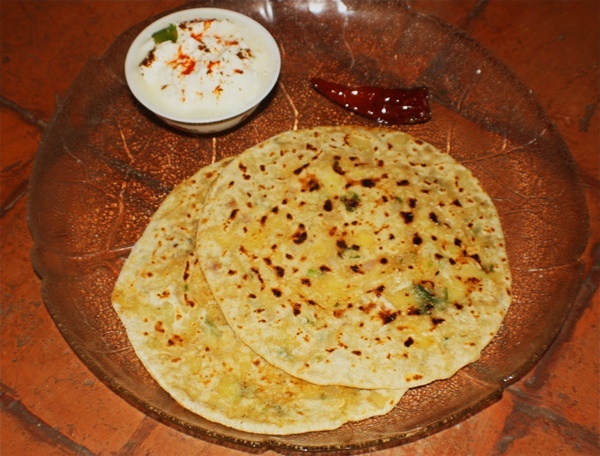 Aloo parathas are served with curd and pickle. You can also serve them with Spicy Chickpeas for wholesome meal for lunch. Enjoy ! Salt to taste,Water to knead. For the filling : Mash the boiled potatoes and all the other ingredients for the stuffing and mix well. For the Dough : Mix flour, salt and water together to make soft dough. Knead the dough for a few minutes on a lightly greased surface to make smooth and pliable dough.Set the dough aside and cover it with a damp cloth. Let the dough rest for at least ten minutes. Make lemon size dough balls. For step by step instructions on how to stuff and cook the parathas, please check my recipe for Puran Poli ~ A Sweet Paratha. Serve with Yogurt and Chilli or Mango Pickle. This entry was posted in All Recipes, Breads/Cakes/Rotis/Parathas and tagged Aloo Paratha, Indian Bread by Kamakshi. Bookmark the permalink.